About this book/synopsis: Ralph Clark draughted his first railway layout plan one hot afternoon in July 1935 while on a cycling holiday in Wales. But it was not until after the end of the WWII that the idea of drawing station plans (on site) and starting a colllection of them evolved. By 1947, he had decided to offer some of the plans to the railway enthusiast in the form of a small booklet, and published "Rail & Platform Plans of British Stations", along with 3 similar booklets containing station illustrations pertinent to the West Country, the South-East, and Wales. This venture wasn't so successful - he did a little more than break even, but not enough to encourage further endeavours of the same ilk. It was suggested to him by a friend that he might be decades ahead of his time - it was clear the market was not ready for what he had to offer. 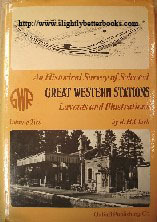 This second volume was prompted by the release of many more official diagrams of Great Western Stations by permission of British Rail Western Region and the Oxford Publishing Company following on from the publication of volume one. The wider variety of diagrams available to the author meant that there was more of a selection suitable for book publication where more than one existed for a given station. The selection in volume two is meant to include some of the more important stations, some of those that hold more interest than importance and some which qualify based on the historical importance of the line they inhabited. Each station has one or more black & white photographs, text and a diagram "A" and "B". The "A" diagrams indicate track layout, neighbouring or crossing roads, embankments, sheds, stores, sidings, offices, oil and coal points, cattle pens, cranes, docks, hotels, lavatories, gas meters, signalboxes and gates and are usually to scale, e.g. 120FT to 1 inch. The signalled, or "B","C", and "D" diagrams are not to scale and are simple line diagrams indicating track layout, passenger station, and of course where the signals are such as up main home, up relief home, down relief adv. st., down relief start, down goods loop start, up relief intermediate start, up goods running loop, private sidings and so on. The text section for each station is small but lists these facts: Origin (of the station - e.g. G. W. R. absorbing the Berks & Hants Rlwy in 1846), when it opened, renaming (where applicable), closure date (where applicable) and plan date. Interesting points are noted, e.g. were the buildings typical or unusual, and what style were they built in? Did the track layout remain the same and why did it change? When were parts of the layout lifted and why? Even signal box opening times might be found in the text! Dates are noted where they are known. Incredibly useful too is the Further Reading Section for each station - this can highlight some real gems of books to get hold off to indulge the appetite for GWR stations. IMPORTANT TO NOTE: Where possible the station plans have been dated. If a date is unknown and other authoritative sources have not known either, then the date has been omitted. Some plans have had to be dated as "circa" - either due to the fact that the date the plans have on them is the publication date and they would have been prepared some time prior to that, or because [in the case of the signalled diagrams] they are current of a particular time within a particular range of years. Abingdon, Acocks Green, Aldermaston, Alford Halt, Andoversford & Dowdeswell, Avonwick, Barmouth, Baschurch, Bodmin Road, Boncath, Bourne End, Box, Bradford-on-Avon, Brecon, Brent, Bridport, Brixham, Bruton, Buckfastleigh, Camerton, Carmarthen, Castle Cary, Chacewater, Challow, Cirencester, Clynderwen, Colwall, Conwil, Dawlish, Dawlish Warren, Derry Ormond, Devynock & Sennybridge, Dymock, Earlswood Lakes, Evershot, Fishguard & Goodwick, Fishguard Harbour, Gara Bridge, Gerrards Cross, Gobowen, Gwinear Road, Hall Green, Haverfordwest, Hayle, Heathfield, Hele & Bradninch, Helston, Horrabridge, Ivybridge, Kingsbridge, Kingswear, Lapworth, Leominster, Limpley Stoke, Liskeard, Llanilar, Llanpumpsaint, Loddiswell, Looe, Lostwithiel, Ludlow, Maes-y-Crugiau, Maiden Newton, Marlow, Milford Haven, Morehampstead, Nancegollan, Neath General, Newcastle Emlyn, Newquay, Neyland, Norton Fitzwarren, Par, Pembroke, Pembroke Dock, Penzance, Pershore, Pont Llanio, Praze, Rhayader, St. Austell, St. Ives, Saltash, Sandford & Banwell, Saunderton, Shrivenham, Silverton, Sparkford, Steventon, Taunton, Tavistock, Teignmouth, Tenby, Thatcham, Torquay, Truro, Twyford, Wellington (Somerset), Wheatley, Witham, Yelverton.